The man who is accused of decapitating his neighbour last Wednesday was on Monday remanded to prison by Magistrate Alex Moore, when he appeared in the New Amsterdam Magistrate’s Court. 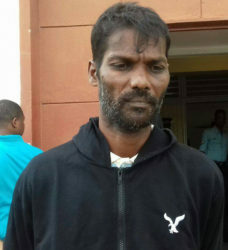 Jainarine Balgobin, 39, a labourer at the Albion Estate and of Lot 370 Belvedere Squatting Area, Corentyne, was charged with murdering 53- year old Bhumattie Delall, of Lot 351 Belvedere Squatting Area, Corentyne. The man was not required to plead to the charge. Balgobin stood barefoot in the court as he seemed lost in his thoughts. He is expected to make his next appearance at the Albion Magistrate’s Court on the 12th December.